A roadside stop just outside Mammoth Cave National Park in Brownsville, Kentucky, where I found this one stretch of a country road and was able to stand in the center. In order to minimize time standing like that in the road, I metered to find that mean shutter speed before walking there. 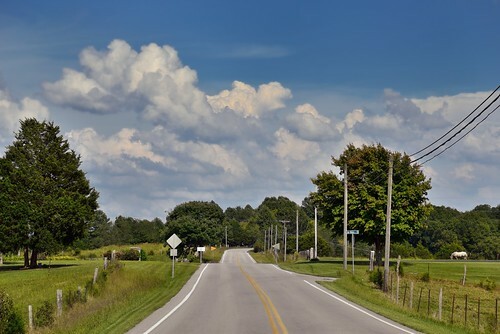 I would then only have to focus on composing the image which in my mind was a blend of the farmland and highways next to me with the blue skies and clouds above. The road ahead would then be that leading line to draw the eye into the image.